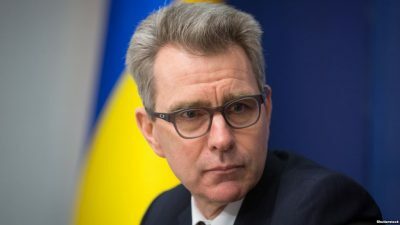 The former US Ambassador to Ukraine during EuroMaidan and present chief diplomat in Greece Geoffrey Pyatt predicted that Turkey’s ties with both the US and Greece will go through what he described as “turbulence” ahead of President Erdogan’s reelection vote next year. This ambiguous warning can be interpreted in one of two ways. The decontextualized understanding is to think that he’s hinting that President Erdogan will cynically stage various highly-publicized provocations against them in order to galvanize the electorate and appeal to nationalists, while an informed reading would be that the US plans to use Greece as a Hybrid War destabilization tool against Turkey during this sensitive time while hiding behind the “plausible deniability” of the Mainstream Media’s messaging that President Erdogan is really to blame. The second interpretation is probably the most accurate because Pyatt has proven himself to be a false flag and perception management master after his ‘success’ during EuroMaidan, so his words shouldn’t ever be taken at their face value or in ‘good faith’. That said, there are plenty of preexisting problems between Greece and Turkey, and all that the US has to do is subtly manipulate this tense situation so that each party engages in a self-sustaining cycle of escalation in order to promote what they believe to be their own interests. This strategy aligns with the classic third-party intelligence goal of “scenario superiority”, or provoking mutually disastrous divide-and-rule conflicts like what the US has a track record of doing with the Iran-Iraq War and the Soviet-Afghan one, for example. The incentivizing catalyst in this case could easily be access to energy resources such as the ones that are disputed between Turkish-controlled Northern Cyprus and the rest of pro-Greek “rump” Cyprus. Any exacerbation of this “frozen conflict” could provoke a third intra-NATO crisis with Turkey such as the ones that the US and France already have with Ankara over their support of Kurdish militants in northern Syria, thus furthering Ankara’s fears that it’s being strategically encircled by its former allies as punishment for its developing post-coup multipolar pivot. In addition, worsening Turkish-Greek tensions could have profound energy consequences for Europe, too. The Trans-Adriatic Pipeline (TAP) being built from Azerbaijan to Italy across Turkey, Greece, and Albania could potentially have its supplies disrupted if Ankara decides to wield energy as an instrument of pressure in this dispute, thus making its competitor project of the Turkish/Balkan Stream much more attractive by comparison because of its possible Bulgarian route. Any serious speculation over Turkey’s reliability as TAP’s transit state to the EU through Greece could be taken advantage of by the US in order to sell its relatively costlier LNG to the bloc instead. Likewise, Turkish/Balkan Stream would have to forgo any prospective plans for transiting through Greece and instead be forced to use Bulgaria as its entry point to the EU, once again making the Balkan state a pivotal energy player and returning the strategic situation back to its South Stream days when Sofia commanded an irreplaceable role in facilitating the Russian-EU energy trade. Conclusively, when bearing in mind these interconnected strategic factors, Pyatt’s warning can be interpreted more as a threat in conveying America’s intentions to provoke another Greek-Turkish crisis in order to return Russia to its erstwhile pipeline transit dependence on pro-American Bulgaria and improve the appeal of costly US LNG exports to Europe.